All permit applications for the upcoming year will open on December 1st of the current year. It is not possible to place a hold on a date. Submitting an application does not guarantee approval of the requested date, time, or location. Your ceremony is only confirmed when you have received a permit. Please contact permits@bbp.nyc before applying to discuss availability if your details are not flexible. Wedding ceremonies can only be held at the Pier 1 Granite Prospect, Empire Fulton Ferry Boardwalk, or the Main Street Pebble Beach. Please review the map at the bottom of this page. Wedding ceremonies cannot exceed 1.5 hours and may have a maximum of 100 guests. It is not allowed to set up staging, tables, podiums, tents, or amplified sound for ceremonies in the park. A maximum of 10 folding chairs may be brought by your party if there are guests in need. Wedding permits do not grant exclusive access to the location listed. Pier 1 Granite Prospect ceremonies must maintain a path at all times on the waterfront promenade that allows for the general public to pass by. Wedding receptions are not allowed in the park. Permits for wedding or engagement photography are not required unless your group is larger than 20 people or you plan to use more than handheld photography equipment. This is applicable to non-commercial wedding or engagement photos only. Cancellations or rescheduling: Permits fees are non-refundable. Cancellations after your application has been submitted will not result in a refund. Ceremonies can be rescheduled within the same calendar year depending on availability. 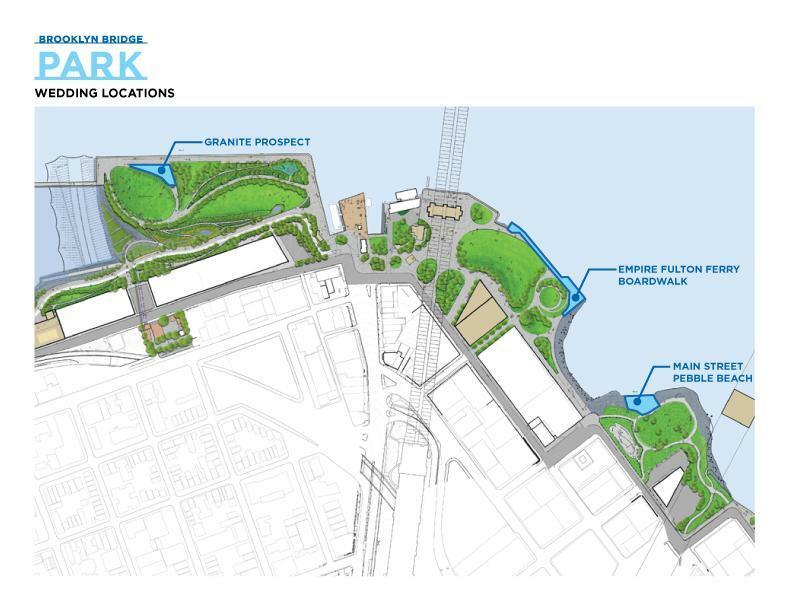 If you wish to reschedule you must contact permits@bbp.nyc at least 24-hours in advance, Monday-Friday, of the date you have received a permit for.